ARP is a specialist manufacturer of Architectural Aluminium Roofline products. Using a combination of extruded, pressed and die cast aluminium offering the specifier the highest standards of performance, visual appeal and long life. 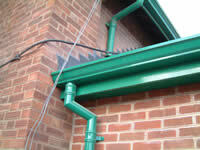 Also see Dales and Marley sectional gutter systems.